The demonetisation move announced in November 2016 seems to have taken a toll on the transactions in the already-subdued real estate sector. While the industry insiders rue about the fact that sales slowed down after demonetisation and the absorption rate of unsold inventory remains low, there are some who say that while investors have got out of the market post demonetisation, there has been an uptick in end user demand for ready-to-move-in properties or those nearing completion and projects of developers backed by corporate houses. A recent report released by real estate research firm Knight Frank shows that the first half of the calendar 2017 saw an 11 per cent decline in sales over that in the previous year across the eight major markets in the country, including Mumbai and NCR. While the sales registered in the first half were the lowest in the past five years, the report further shows that the new residential project launches crashed 41 per cent in the first half of the year to hit a seven-year low. But there are some who feel that while the first quarter ended March 2017 remained slow in terms of demand, the second quarter ended June 2017 has seen a rise in end user demand. “While the shortage of liquidity post demonetisation has driven out the investor-led demand, the market has turned into an end user one. The factors that are leading the same are bottoming out of the residential prices, increase in affordability due to decline in interest rates (buyers can get higher value of loans for the same EMI) and availability of houses in completed or near-completion projects. The customers are also moving towards reputed developers such Godrej Properties, Tata Housing and Mahindra Lifespaces,” said Akash Bansal, head the North India operations of Research and Advisory for Liases Foras. The Knight Frank report points that while the residential market got hugely impacted by the demonetisation move, the compliance needs driven by the implementation of the Real Estate Regulatory Authority (RERA) in May 2017 has further impacted fresh launches in the market. It said that barring Chennai, new projects dried up in all the eight cities. NCR and Ahmedabad were the worst hit with launches plummeting by 73 per cent and 79 per cent, respectively. 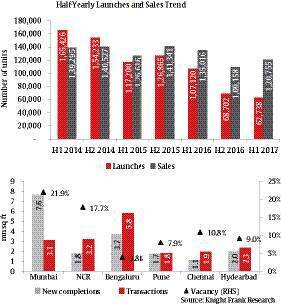 Chennai was the only market to record a marginal four per cent year-on-year (y-o-y) rise in launches. The Knight Frank report shows that in the past three years, the number of unit launches has declined to less than half. While the number of units launched in first half of 2014 stood at 1,65,426 units, that in H1 2017 stood at only 62,738 units. Ghulam Zia, executive director (advisory, retail and hospitality), Knight Frank India, said that the fall in launches is on account of slowdown in demand and builders’ focus on completing existing projects in view of the new Real Estate (Regulation and Development) Act. Also, with the government’s impetus towards affordable housing, the industry has seen a shift towards such projects. In the first half of this year, the report states that around 71 per cent of the new launches have been in the affordable segment i.e under Rs 50 lakh price segment. The share of this segment stood at 52 per cent in the same period last year. “NCR, Kolkata, Pune and Ahmedabad drive the revival of affordable housing projects with around 80 per cent of launches in these cities in the sub Rs 50 lakh segment,” said the report. While on the y-o-y basis, there has been a decline in sales across the major markets, the report said that there was a 11 per cent rise in sales over H2 2016, which was hit by demonetisation. The data show that as against the sales figure of 1,35,016 units in H1 2016, the sales registered in H1 2017 fell to 1,20,755 units. This was, however, higher than sales of 1,09,158 units registered in H2 2016, which was impacted by demonetisation. “Government thrust towards affordable housing, widespread discounts on ready inventory and improved sentiments among buyers courtesy RERA drive sales volumes,” said the Knight Frank report. The Delhi-NCR market witnessed a 26 per cent fall in sales in the first half of 2017 as demand continued to remain sluggish post-demonetisation despite a price correction of 20 per cent in the last 18 months, according to Knight Frank. As against a sale of 23,092 units in H1 2016, the sales in the first half of this calendar has been only 17,188 units. “NCR market continues to find newer depth and slide continues. NCR housing market is passing through the worst phase. No end to it,” said Zia. As sales continue to remain slow, the unsold inventory across the country remained tall at 5,96,044 units across the eight cities in H1 2017. The report said unsold housing stock in the Delhi-NCR property market stood at a high of 1.8 lakh units – highest in the country — that will take developers four and half years to sell. However, as developers have been striving to complete their existing projects, there has been a surge in inventory in the ‘ready for possession’ category. According to the report, the office market also declined and the office transactions fell 10 per cent in H1 2017 to 18.1 mn sq ft. While the vacancy levels fell to a 12 per cent from a high of 21 per cent in 2012, the average rental values across six cities grew at seven per cent y-o-y during H1 2017. While Mumbai saw flat rental growth, Hyderabad and Bengaluru witnessed the strongest rental growth at 14 per cent and eight per cent, respectively. The IT/ITeS sector, however, witnessed a fall in its share to 39 per cent in H1 2017 from 43 per cent in the corresponding period a year ago.